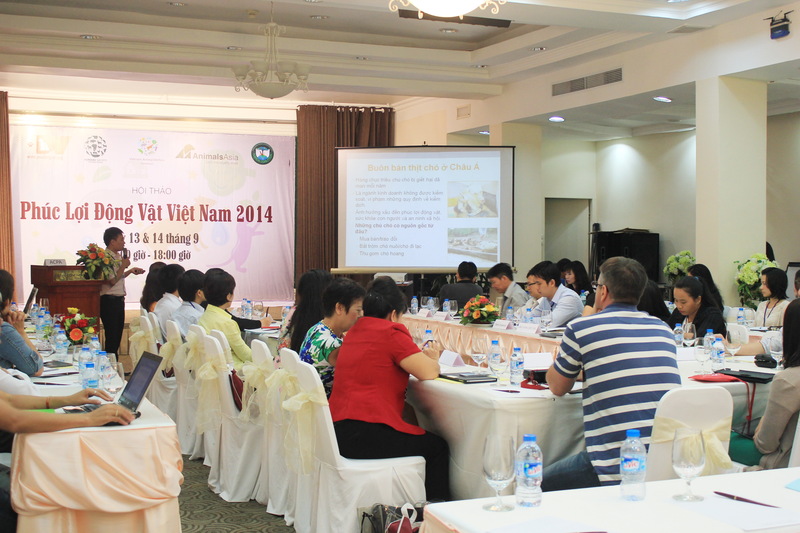 Participants listen to an ACPA presentation on dog meat consumption in Asia at the 2014 Vietnam Animal Welfare conference on September 13, 2014 in Ho Chi Minh City. Vietnam kills more than 5 million dogs for their meat every year, Le Duc Chinh, coordinator of the Asia Canine Protection Alliance (ACPA) Vietnam, said over the weekend at the 2014 Vietnam Animal Welfare conference in Ho Chi Minh City. Although dog meat has been consumed in a number of countries, including several in Europe, it is consumed mainly in Asia, Chinh said on Saturday. According to ACPA statistics, Vietnam ranks second on the list of Asian countries which eat the most dog meat, following China, which kills 10 million canines per year. In his presentation, the ACPA coordinator also pointed out the main sources for dog meat in Vietnam, mentioning that dogs are smuggled from Thailand, Laos and Cambodia, in addition to domestic dogs that are stolen. He also expressed his concern over dog welfare by presenting the fact that dogs are usually caught using iron rods, and are then crammed into small cages to be brought to restaurants. Chinh told Tuoi Tre News that the ACPA is continuing its surveys at dog meat restaurants around Vietnam to get more detailed numbers on dog meat consumption. “We believe that the real number [of dogs killed] must be larger, because no country has regulations or laws that control the dog meat trade,” Chinh stated at the conference. The dog trade was one of the topics discussed at the two-day event held by the Yeu Dong Vat (Animal Love) Vietnam organization, in collaboration with other animal protection organizations, including the Hong Kong-based Animals Asia, the U.S.-based Humane Society International, and the Kairos Coalition. According to the organizers, the conference was an exchange between domestic and international animal protection organizations for animal welfare in Vietnam. The event gathered more than 60 animal experts and activists who delivered speeches and presented thoughts on the welfare of three groups of animals, namely pets, farm animals, and wild animals. Vi Thao Nguyen, co-founder of Yeu Dong Vat, told Tuoi Tre News that animal welfare can be understood as the best, most humane way for people to treat animals in order to minimize their pain. There are five principles of animal welfare, including no starving, no mental and physical pain, no sickness, no nervousness, and the freedom to express instincts. Dr. Tuan Bendixsen, the Vietnam director of Animals Asia, attended the event and spoke about wild animals. He said that there were around 10,000 wildlife farms in Vietnam with around 3,000 wildlife individuals from 70 different species in 2013, citing Vietnamese Ministry of Agriculture and Rural Development figures. He said that although the government has policies regarding wild animals, especially bears, there are no specific regulations on wild animal welfare. He said bear farms in Vietnam have not reached the five principles for animal welfare and wild animals in the Southeast Asian country are currently fed like farm animals. Tuan added that there are now around 4,500 bears being hunted to be kept at farms, quoting the agriculture ministry. Bears are often fed once a day because feeders believe they do not need to eat much, but this is wrong, he said. Farm animals were also a hot topic at the event. Dr. Vu Dinh Ton, from the Hanoi-based Vietnam National University of Agriculture, reported that there are 28,500 small-scale farm animal slaughter facilities nationwide. On average, each facility kills one buffalo, five pigs or five poultry per day. One problem that causes issues regarding animal welfare is that slaughterers are usually uneducated and do not know how, or do not care how, to properly kill an animal. Dr. Ton said Vietnam faces conflicting issues between socio-economic demands and the demands of animal, and people need to find a balance when they work for animal welfare. “People now have started to care about animal welfare because it is not only beneficial for animals, but it is related to other social issues like famine and pollution, and those all need to be solved at the same time,” Yeu Dong Vat co-founder Vi Thao Nguyen said. “I believe in the near future, through the work of many organizations, people will show more and more interest in animal welfare. “It is just the first step in a long journey."